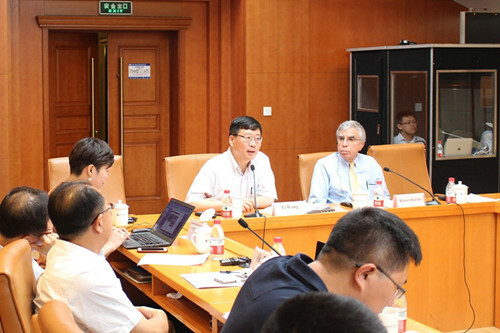 On the morning of July 26th, the Institutes of Science and Development of the Chinese Academy of Sciences (CASISD) held a workshop on “Coordinated Governance of Climate Change and Environmental Pollution under Carbon Market Mechanism”. 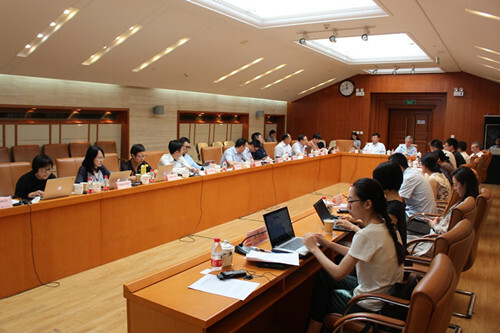 The workshop was chaired by Wang Yi, member of the Standing Committee of the National People's Congress and vice president of CASISD. Robert Stavins, professor of the Kennedy School of Government at Harvard University, gave the keynote speech, and experts from government agencies, research institutes and universities participated in the discussion. First, Robert Stavins gave a keynote speech titled “Carbon Pricing and Carbon Markets: A Summary of Global Experiences over the Past 30 Years”. 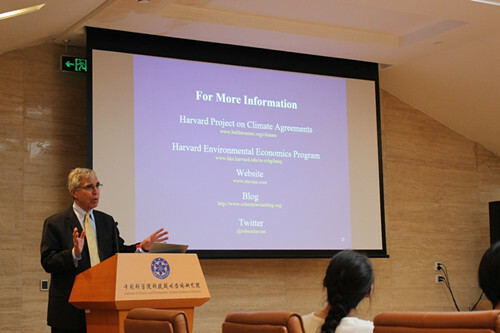 In the speech, Professor Stavins systematically reviewed the application of carbon pricing mechanisms worldwide, and discussed the advantages and disadvantages of carbon tax and carbon market under different social and economic conditions, as well as the co-benefits of carbon pricing on air pollution control. From the international cases, Professor Stavins summarized a series of useful experience for China's carbon market development. In the next three presentations, Professor Ge Chazhong, Director of the Environmental Policy Department of the Institute of Environmental Planning, Ministry of Ecology and Environment, discussed the issue of co-governance of climate change and environmental pollution in the context of government institutional reform. Chai Qimin, Director of the International Department of the National Center for Climate Strategy at the National Development and Reform Commission, discussed the progress and challenges of national carbon market development. Professor Tan Xianchun, deputy director of the Institute of Sustainable Development, CASISD, discussed carbon pricing and China's low carbon technology potentials and cost-benefit assessments. During the roundtable discussion, participants had heated discussions on the synergies of carbon pricing policies and the opportunities and challenges after institutional reform. Professor Xu Jintao from Peking University and Professor Song Guojun from Renmin University of China compared the feasibility of the carbon market and carbon tax in China's specific contexts, and argued that the policy interaction between carbon emission reduction and air pollution prevention is very complicated and needs to be coordinated in many aspects; Professor Chen Bin from Beijing Normal University pointed out that carbon emissions reduction can not only be synergistic with air pollution control, but also with the management of water resources; Qian Guoqiang from SinoCarbon Innovation & Investment, argued that from the perspective of carbon market service companies, even though it is important to emphasize co-benefits, climate change should not be regarded as a by-product, but should have its own goals and focus; Wu Dongsheng of Shanxi Development and Reform Commission pointed out that the key to addressing climate change is to change energy structure and economic structure, so the NDRC will still play an important role in climate change. Wang Yi concluded the workshop by pointing out that China currently faces multiple challenges simultaneously: on the one hand, it needs to deepen reforms in social and economic fields; on the other hand, it must firmly win the battle against air pollution. This may create conflicts of policy goals at both micro- and macro- levels. Therefore, the choice between carbon tax and carbon market, and coordination of climate policy and air pollution policy, need to be studied in the context of China's social and economic transformation and institutional reform. As researchers, we do not need to fight for one side, but need to find a solution that is realistic and can provide policy recommendations for the coordinated climate and environmental governance. This workshop is the sixth in the workshop series of "carbon pricing policy dialogue", jointly sponsored by CASISD, the World Bank, and the Energy Foundation. Since the beginning of the series, researchers and practitioners from both China and abroad have been invited to conduct in-depth discussions on carbon pricing theory, operation, legislation, and collaborative governance. The results of the workshop have played an important role in scientific research and policy making in the field of carbon pricing.